This is an urgent problem. For in this game, far more than money is at stake. When VC firms prize time on site over truth, a lucky few may profit, but civil society suffers. When shareholder return trumps collective well-being, democracy itself is threatened. The reality is that business models breed behavior, and at scale, that behavior can lead to far-reaching, sometimes destructive outcomes. Facebook — the ultimate unicorn — was weaponized to spread fake news during the presidential election. Uber has come under fire for supporting dubious political agendas, tolerating a toxic workplace culture, manipulating employee wages, and circumnavigating regulations. Medium has backpedaled, having realized that while clickbait content may produce the ad-revenue hockey stick investors want to see, it undermines the founders’ original mission to create a publishing model that enlightens, informs, and rewards quality over quantity. Many well-reasoned think pieces* have been written about the gaping chasm between the world we need and the world that exists. Today, we want to provide the seeds of a solution — and to encourage founders, investors, foundations, corporations, and their allies to organize around it. A company’s business model is the first domino in a long chain of consequences. 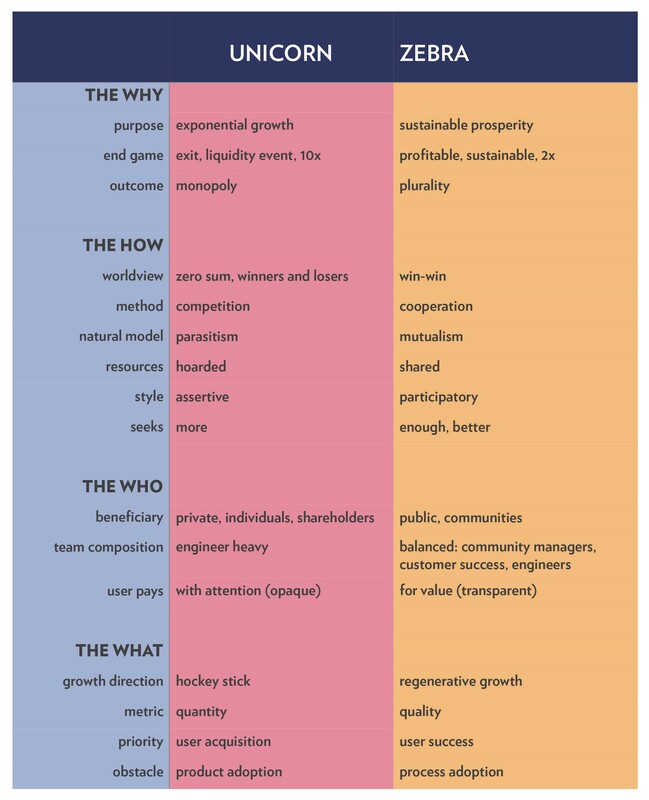 In short: “The business model is the message.” From that business model flows company culture and beliefs, strategies for success, end-user experiences, and, ultimately, the very shape of society. Think of our most valuable institutions — journalism, education, healthcare, government, the “third sector” of nonprofits and social enterprises — as houses upon which democracy rests. Unicorn companies are rewarded for disrupting these, for razing them to the ground. Instead, we ought to support companies that provide extreme home makeovers. We can’t assume these companies will be created by accident. We must intentionally build the infrastructure to nurture them. This new movement demands a new symbol, so we’re claiming an animal of our own: the zebra. The capital system is failing society in part because it is failing zebra companies: profitable businesses that solve real, meaningful problems and in the process repair existing social systems. Drawing from the work of many thinkers,** we’ve developed a portrait of what a zebra company is, does, and stands for. This chart outlines how a zebra company compares with its mythical cousin, the unicorn. For a downloadable, printable version, click here. WHY IS IT SO HARD TO BUILD ZEBRA COMPANIES? In the last year we’ve spoken to countless founders, investors, foundations, and thought leaders who believe zebra companies are crucial to our society’s success. Yet zebras struggle for survival because they lack the environment to encourage their birth, let alone to support them through maturity. “I wonder how many change-makers are stuck under the demands of unicorn investors,” said TJ Abood of Access Ventures, who added that he worried about “the opportunity cost to society” under this model. 1. The problem isn’t product, it’s process. Tech isn’t a silver bullet. Building more won’t solve the biggest challenges we face today. An app won’t address the homelessness crisis in San Francisco or unite bitterly divided partisan politicians. The obstacle is that we are not investing in the process and time it takes to help institutions adopt, deploy, and measure the success of innovation, apps or otherwise. 2. Zebra companies are often started by women and other underrepresented founders. Three percent of venture funding goes to women and less than one percent to people of color. Although women start 30 percent of businesses, they receive only 5 percent of small-business loans and 3 percent of venture capital. Yet when surveyed, women — who perform better overall than founding teams composed exclusively of men — say they are in it for the long haul: to build profitable, sustainable companies. 3. You can’t be it if you can’t see it. Look hard outside of Silicon Valley and you’ll find promising zebra companies. But existing and aspiring business owners haven’t seen enough proof that they’ll have a higher chance of becoming financially successful and socially celebrated if they follow sustainable business practices. They lack heroes to emulate, so they default to the “growth at all costs” model. Imagine if every fund allocated a small percentage for zebra experiments. The investing firm Indie.vc has bravely stepped into this space, but it shouldn’t stand alone. 4. Zebras are stuck between two outdated paradigms, nonprofit and for-profit. For young companies pursuing both profit and purpose, the existing imperfect structures (hybrid for-profit/nonprofit, Public Benefit Corps, B-Corps, L3Cs) can be prohibitively expensive. The expense comes not only in legal fees, but in the consumption of a founder’s most precious commodity: time. Months are lost searching for aligned, strategic investors who are both familiar and comfortable with alternative models. This presents a chicken-and-egg problem for foundations, philanthropists, and investors alike. They are spooked by unproven alternative models, but companies can’t prove their models work without experiments to fund them in the first place. Moreover, the current tax system doesn’t reward — or even acknowledge — anything other than for-profit (tax) or nonprofit (deduction) strategies. From the IRS’s perspective, there is nothing akin to a “50 percent financial return, 50 percent social impact” investment. This leaves many potential investors in a straitjacket. 5. Impact investing’s thesis is detrimentally narrow and risk-averse. Much of the $36 billion in impact investment funding is restricted to verticals like clean technology, microfinance, or global health. This immature market limits innovation in other sectors — like journalism and education — that could desperately use it. “So how will investors turn a profit and mitigate risks?” you may be asking. Dividends? Equity crowdfunding? We don’t have all the answers. But we’ve seen how a company’s business model and values can negatively affect the bottom line (#deleteuber). So what if the opposite is also true? What if more-enlightened dollars invested in more-enlightened companies led to stronger returns? What if companies that stood for something were in fact more profitable? Patagonia, Warby Parker, Zingerman’s, Etsy, Mailchimp, Basecamp, and Kickstarter are a start — but the world needs so much more. Our goal is to gather zebra founders, philanthropists, investors, thinkers, and advocates to meet in person this year for DazzleCon (November 15–17 in Portland, Oregon)— a group of zebras is called a dazzle! — to learn from one another and pool resources, ideas, and best practices, to collectively advance this set of ambitions. From this gathering, we will capture and share the unique patterns that zebra founders and funders are finding, and we’ll turn a loose network into a powerful, cohesive movement. Are you in? Go here. Jennifer Brandel is the co-founder and CEO of Hearken. Mara Zepeda is the co-founder and CEO of Switchboard. Extra special thanks to Astrid Scholz, founder and CEO of Sphaera. DazzleCon is proudly supported by Knight Foundation, Artha Investing for Impact, Social Capital Markets, Portland Incubator Experiment, and Catalyst Law. Interested in sponsoring? Get in touch. **Jenn Armbrust’s Feminist Business School, Amber Case’s Calm Technology, Jerry Colonna, Ali Schultz and the work of Reboot.io, Anil Dash in conversation with Krista Tippett, in On Being; Seth Godin’s Tribes: We Need You to Lead Us; Jonathan Harris’ Modern Medicine; Ivan Illich’s Deschooling Society; Michael Karlberg’s “Beyond the Culture of Contest”; Jerry Michalski’s “What if we Trusted You?,” Howard Rheingold’s “Toward a Literacy of Cooperation”; Douglas Rushkoff’s Throwing Rocks at the Google Bus; Natasha Dow Schüll’s Addiction by Design; Shel Silverstein’s poem “Zebra Question”; Peter Thiel’s Zero to One; Ari Weinzweig’s Anarchist’s Guide to Building a Better Business series. Zebra companies have been referred to in journalism articles and academic papers, and by some VC firms. Thanks to Jenn Armbrust, Adam Brault, David Chen, Molly deAguiar, John Dimatos, Lennon Day-Reynolds, Corey Ford, Christie George, Seth Godin, Andrew Haeg, Jason Kunesh, Rachel Hankerson, Jonathan Harris, Jennifer Jordan, Luke Kanies, Duncan Malashock, Kanyi Maqubela, Ellen Mayer, Julie Menter, Douglas Rushkoff, Jake Shapiro, Michael Slaby, Rick Turoczy, Stephanie Pereira, April Rinne, Tom Watson. And to Jen McDonald for editing; and to Arthur Jones for the illustrations.